Now don’t get us wrong – we *love* us some deep fried wontons. Brittle golden pastry, juicy pork filling, and a drizzle of sweet ‘n’ sour to get the tastebud party going… oh my dayum! But like all fried foods, crispy wontons are really best left for treat time. But fear not! You can still have your delicious wontons and eat them too! The best part of wonton soup is that it is ridiculously simple to rustle up. Just like tradition dictates, we wrap a delicate pastry around a meaty filling, but we like to add some veg like tender bok choy too. Then we cook ’em up in boiling water before serving with a simple chicken broth. 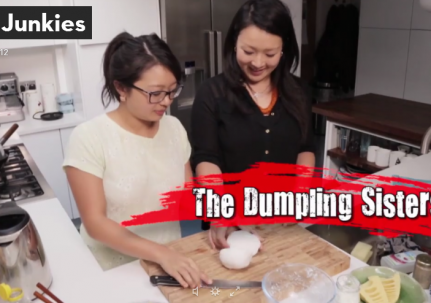 The result is silky wontons with a lush filling and a really qīng soup to wash it all down. Eaten like this, wontons are true to their name, where wonton literally means ‘to swallow a cloud’ (lovely visual, eh?). We get our wonton wrappers from the Chinese supermarket – you might want to ask for ‘soup wonton’ wrappers, as some manufacturers like to change the recipe slightly depending on method of cooking (frying vs. boiling). * No disrespect towards K-Fry here… we’ve definitely had our fair share of… err.. ‘moments’ with the 11 herbs and spices. Start prepping the filling by soaking the Chinese mushrooms in hot water for 10 minutes. Trim any extra fat from the chicken thighs before giving them a good d’huk (that is, to hack into small pieces). 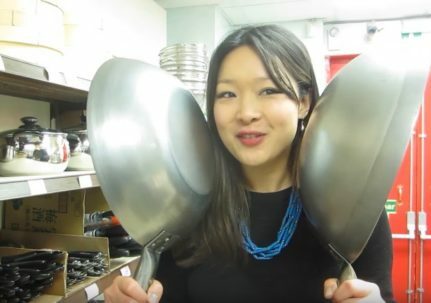 Pop into a large mixing bowl. Add all of the usual suspects for tenderising and flavouring: baking soda, cornflour, salt, pepper, sesame oil, and light soy sauce. 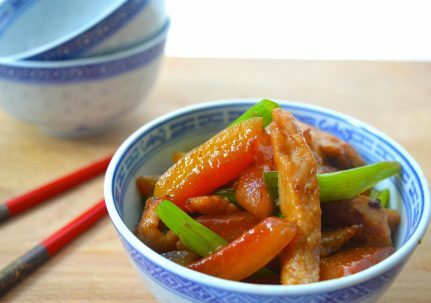 Grab your chopsticks and mix the chicken in one direction until it all comes together like a sweet, sweet symphony. We had a great question on YouTube about why we mix in one direction. In Cantonese cooking we like often like to d’huk the meat into small pieces, then tenderise and season, before bringing it back together. By mixing in one direction for about a minute, you’ll notice that the chopped meat binds to itself. This means that when you bite into the wonton the filling won’t be all loose, but rather compact and moist (as well as tender and flavoursome!). Cheers to Terri for bringing this up! Dice up the bok choy, softened mushroom (remember to take off the stalk! ), bamboo shoots, ginger, and garlic. Add all of these goodies to the bowl and mix to combine. Cover and set aside in the fridge, giving the filling some time to chill out and get flavoursome! After half an hour in the fridge, the filling is ready to be wrapped! In our video we demonstrate two methods for wrapping, one very easy way and one easy way. Nevertheless, we encourage you to have some fun and get creative. As long as you get a tight seal on the pastry, the wontons will keep their shape and juiciness. The secret to getting a super qīng end product is to cook the wontons separately in water before adding the broth. This prevents the excess gluten from the pastry thickening up the broth – no one likes gloopy soup wontons! Start by bringing a large pot of water to the boil. Gently slide the wontons into the boiling pot – you may need to do this in two batches so they have plenty of room to swim about. Loosen them up with chopsticks. 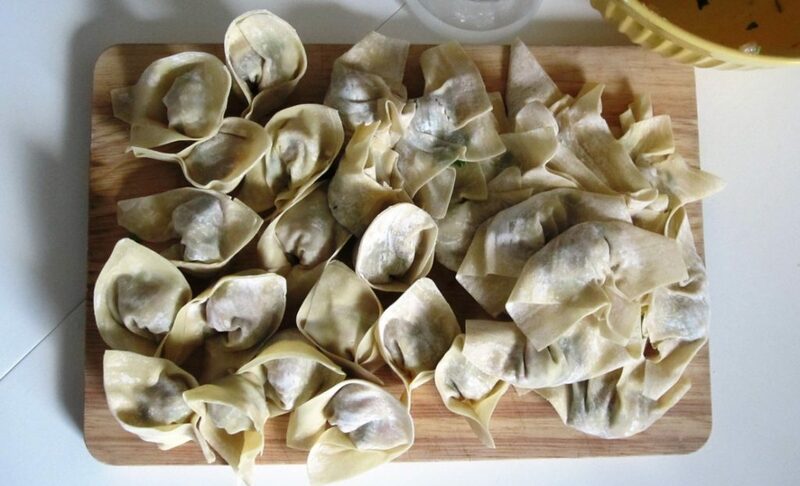 The wontons are ready to be netted up from the water when they float to the top and the filling is cooked thorough – about 5-8 minutes of rapid boiling should do the trick! While the wontons are cooking, bring the chicken stock up to a boil. Add ginger for an extra warming effect, as well as salt and pepper to taste. For extra greens, add chopped bok choy to the broth for 45s to 1 min just before serving. To serve, simply spoon the clouds into a bowl and ladle the clear broth on top. 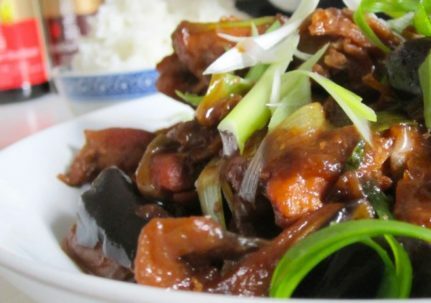 For extra delightfulness, add a few sprinkles of sesame oil, light soy sauce, and spring onion. I have a question though. In your Wonton Soup Dumplings recipe it lists “1/2 light soy sauce” is that a teaspoon? Hello sisters, I just popped a bunch of these wontons into the freezer, to save for later but I just realized that i have no idea how to cook the little guys from frozen. How do you guys do that?